Dare to run is the inspiring story of Amit and Neepa Sheth, a husband-wife duo who took up running as a sport in their late 30s. In a collection of essays written over five years, Amit, a self acclaimed couch potato takes us long with him on an incredible journey of determination, discovery, courage, self-awareness and self-belief. He takes us with him from his first, almost fatal, 200 meter jog on a beach in Mumbai, to the finish line of The Ultimate Human Race: the 89 km Comrades Ultra Marathon in South Africa. 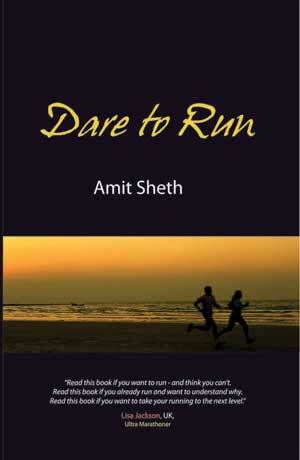 Along the way, Amit uses a combination of poetry, philosophy and scriptures to explain his unique perspective on life, religion, spirituality and running. This is a book not just about running but about the need to relentlessly follow your dreams and passions, no matter what they may be. It is a book which encourages you to be the best you can be in all walks of life while at the same time maintaining a certain sense of balance and appreciation for the beauty of existence. It encourages you to enjoy the gift of life to its fullest. The essays describe the journey of an ordinary husband-wife team doing extraordinary feasts, while having to balance family, work, training and injuries. This is a book from which a novice runner will draw inspiration and motivation and it also a book in which an elite athlete will recognize his own strengths and weaknesses. It describes how ordinary people push the limits of their ability to achieve their goals, passions and dreams and it will inspire the reader to do the same. It is a book to be read not only by those who run but those who desire to run. It is a book which dares you to run. When I first read the chapter 'The Agony and Ecstasy of the Comrades Marathon 2009', I immediately went out in search of the writer. What left an imprint on my mind was the way he encapsulated the emotions and moments of the greatest marathon in the world. My 25 years of running was captured in this inspiring essay. It portrays the trials and tribulations, not of running, but of the reality of life. - Naresh Nana, South Africa, 22 Comrades Marathons. - Andrea Moritz, Canada, Ultra Marathoner, Comrades International Ambassador. - Steven Weeks, USA, Ultra Marathoner, Tri-athlete, Comrades Runner. -Fillipo Faralla, South Africa, 16 Comrades Marathons. – Harold Gleave, UK, Marathoner and Comrades Runner.